For the 1956 series of U.S. nuclear tests, see Operation Redwing. When the 2nd Battalion of the 3rd Marine Regiment (2/3) took the Stars model and developed the specifics of it, 2/3's operations officer, Major Thomas Wood, instructed an assistant operations officer, 1st Lieutenant Lance Seiffert, to compose a list of hockey team names. 2/3 would continue the use of hockey team names for large operations. The Seiffert list included ten teams, and the battalion settled on the fourth name on the list, "Red Wings", since the first three, New York Rangers, Chicago Blackhawks, and New Jersey Devils, each could be misconstrued as a reference to military units currently in Afghanistan at the time. The name has been widely mis-stated as "Operation Redwing" and sometimes "Operation Red Wing". [n 1] This error began with the publication of the book Lone Survivor: The Eyewitness Account of Operation Redwing and the Lost Heroes of SEAL Team 10, which was written by Patrick Robinson based on unrecorded interviews with Marcus Luttrell. 2/3 eventually abandoned this naming convention out of sensitivity to the local population, instead opting for using Dari names for animals, including "Pil" (elephant) and "Sorkh Khar" (red donkey). After the initial invasion of Afghanistan in 2001, U.S. military and coalition partner operations shifted from "kinetic" operations to those of a counterinsurgency (COIN) nature. One of the primary goals of the coalition by 2004 in Afghanistan was nation-building, that is, providing a security environment conducive to the establishment and growth of a democratically elected government, as well as infrastructure support. A key milestone in this campaign would be the September 18, 2005, Afghan national parliamentary elections. While many of Afghanistan's provinces at this time had stable security environments, one of the most restive continued to be the Kunar Province, which lies in eastern Afghanistan, on the border with Pakistan. For election results to be seen as legitimate by the citizens of Afghanistan and the world at large, all elections throughout the country would need to proceed "unencumbered" (without external influence, by either American and coalition forces or Taliban and anti-American and coalition forces), including those in Kunar. Insurgent activity in Kunar Province during this time came from 22 identified groups, individual groups of which ranged in allegiance from those with tenuous ties to the Taliban and al-Qaeda, to the majority that were little more than local criminals. These groups were collectively known as anti-coalition militia (ACM), and the common thread among all was a strong resistance to the unification of the country and subsequent increasing presence of national government entities in the Kunar, as these would pose a threat to their activities, be these activities attempting to aid a resurgent neo-Taliban, to lumber smuggling. With the goal of successful elections in Kunar, military operations in the area focused primarily on the disruption of ACM activity, and these military operations utilized a number of different units and operational constructs to achieve this goal. The 3rd Battalion of the 3rd Marine Regiment (3/3), which deployed to Regional Command East (RC East) (which included Kunar Province) in late 2004 to conduct stability and counterinsurgency operations in support of Operation Enduring Freedom, identified a number of operational barriers due to Special Operations Command doctrine for the battalion's counterinsurgency work in the area. These barriers included non-sharing of intelligence with the battalion and non-disclosure of impending raids by special operations units in the area. To mitigate these problems, 3/3's staff developed an operational model which integrated special operations forces units into their operations, allowing the sharing of intelligence between the battalion and special operations forces as well as maintaining solid operational control of operations with integrated special operations assets and units by the battalion. Operations that 3/3 conducted based on this model proved successful in disrupting ACM activity. The first of these, Operation Spurs (named after the San Antonio Spurs basketball team), conducted in February 2005, took place in the Korangal Valley, in Kunar Province's Pech District. Spurs utilized Navy SEALs for the opening two phases of this five-phase operation. Similar operations that followed included Operation Mavericks (named after the Dallas Mavericks basketball team) in April 2005, and Operation Celtics (named after the Boston Celtics basketball team) in May 2005. These operations, all of which included Navy SEALs, were conceived and planned by the battalion, with the specifics of those phases involving Navy SEALs being planned by the SEALs. Each operation lasted between three and four weeks. 3/3 planned and executed approximately one of these operations per month, maintaining a consistent operational tempo. The culmination of 3/3's efforts was the April 2005 forced surrender of a regional (and national) "high value" target, an ACM commander known as Najmudeen, who based his operations out of the Korangal Valley. With the surrender of Najmudeen, ACM activity in the region dropped significantly. Najmudeen's surrender, however, left a power vacuum in the region. 3/3 tracked a number of known ACM groups they determined to be possibly seeking to fill the power void in the region. The battalion began planning a new operation, tentatively called Operation Stars, which was named after the Dallas Stars professional hockey team. (3/3's battalion commander, Lieutenant Colonel Norman Cooling, hailed from Texas, hence most operations being named after Texas sports teams.) Stars, like the other operations before it, focused on disrupting ACM activity, although due to Najmudeen's surrender, this activity had dropped and specific groups proved difficult to pinpoint. In May 2005, the Advanced Party of 3/3's sister battalion, the 2nd Battalion of the 3rd Marine Regiment (2/3) arrived in RC(E). Since before deploying to Afghanistan, 2/3's intelligence officer, Captain Scott Westerfield and his assistants, had been tracking a small cell led by a man named Ahmad Shah, based on intelligence sent back by 3/3's intelligence officer. Shah was from a remote region in Nangarhar Province, which borders the south side of Kunar Province. Shah, they determined, was responsible for approximately 11 incidents against coalition forces and Government of Afghanistan entities, including small arms ambushes and improvised explosive device attacks. By June 2005, 2/3 had relieved-in-place 3/3, and had taken the Stars concept and developed a comprehensive operation which they called Operation Red Wings, with the goal of disrupting anti-coalition militia activity, with an emphasis on disrupting Ahmad Shah's activities, which were based near the summit of Sawtalo Sar. 2/3's battalion staff immediately began planning Operation Red Wings as soon as they arrived in Afghanistan. Lieutenant Colonel Andrew MacMannis, 2/3's battalion commander, and his staff, wanted to maintain the operational tempo set by 3/3. 2/3's Operations Officer, Major Thomas Wood, began planning Red Wings off the Stars base, which was a five-phase operation. During this time, 2/3's Intelligence Officer, Captain Scott Westerfield, focused further on learning about Ahmad Shah. His overall intelligence picture of Shah took a substantial leap when 2nd Lieutenant Regan Turner, a platoon commander with 2/3's "Whiskey Company" – a Weapons Company augmented to function like an infantry line company, gathered a wealth of human intelligence about Shah during a patrol, including his full name: Ahmad Shah Dara-I-nur (Ahmad Shah of the Valley of the Enlightened ones); his birthplace, the Kuz Kunar District of Nangarhar Province; his primary alias: Ismael; his chief allegiance: Gulbuddin Hekmatyar, who was based out of the Shamshato Refugee Camp near Peshawar, Pakistan; his team's size: fifty to one hundred fighters; and his aspirations: to impede the upcoming elections and attempt to aid a resurgent Taliban in the region. Although Shah was a relatively unknown entity in the region, he apparently held regional aspirations and possibly had the assistance of Gulbuddin Hekmatyar. 2nd Lieutenant Turner also gathered a number of photographs of Shah. Further intelligence, including human intelligence and signals intelligence, indicated that Shah based his insurgent / terrorist operations out of some small structures outside of the village of Chichal, high on the slopes of Sawtalo Sar mountain in the upper Korangal Valley, approximately 20 miles (32 km) to the west of Kunar's provincial capital, Asadabad. Using imagery intelligence, taken from a UAV on June 17, 2005, Westerfield identified likely structures used for housing his team, IED making, and overwatch of the area below, for IED strikes. The intelligence staff identified four Named Areas of Interest, or NAIs containing specific structures which Shah might be using. These Named Areas of Interest and specific buildings were determined by analyzing and processing a number of instances of a variety of intelligence, including signals intelligence, human intelligence, and imagery intelligence. Westerfield and his staff determined that Shah and his men had been responsible for approximately 11 incidents against American, Coalition, and Government of Afghanistan entities, including IED strikes and small arms ambushes. They determined that Shah and his men would be occupying the area of Chichal in late June, a time of low lunar illumination. The operation would require a helicopter insertion of forces to cordon the area and search for Shah and his men, and they sought to conduct this operation at night, after positive identification of Shah by a Marine Corps Scout / Sniper team, which would walk into the area under cover of darkness some nights before. As with 3/3 before them, 2/3 sought to use Special Operations Forces assets for Red Wings, but unlike 3/3, they sought only the use of Special Operations Aviation assets, specifically, MH-47 Special Operations Aircraft of the Army Special Operations Command's 160th Special Operations Aviation Regiment (Airborne) (SOAR(A)), and not ground forces. The command from which 2/3's planners requested this, however, CJSOTF-A, or Combined Joint Special Operations Task Force – Afghanistan, refused this request, stating that in order for Red Wings to be supported with Special Operations aviation, the battalion would have to task the opening phases of the operation to Special Operations Ground Forces for the opening phases of the operation, with Marines of 2/3 acting in a supporting role. After the initial phases of Red Wings, then 2/3 could be considered the lead, supported element. The battalion agreed to this, realizing, however, that this unconventional command structure defied a fundamental tenet of successful military operations – "unity of command". The operation was presented to a number of Special Operations units working in the area for possible "buy in". U.S. Navy SEALs from SEAL Team 10 and SEAL Delivery Vehicle Team 1 expressed interest. Phase 1: Shaping: A U.S. Navy SEAL reconnaissance and surveillance team is tasked to insert in the region of the suspected safe buildings of Ahmad Shah, observe and identify Shah and his men and specific locations, and guide a direct action team of phase two to structures in which Shah and his men are observed to be staying. Phase 2: Action on the Objective: A SEAL direct action team is to insert by MH-47, followed shortly by Marines, to capture or kill Shah and his men. Phase 3: Outer Cordon: Marines, along with Afghan National Army soldiers, are to sweep surrounding valleys for other suspected insurgents. Phase 4: Security and Stabilization: In the days after the first three phases, U.S. Marines and Afghan National Army soldiers and U.S. Navy corpsmen will provide medical care to the local population and determine local needs, such as improved roads, wells, and schools. Phase 5: Exfiltration: Depending on enemy activity, the Marines will remain in the area for up to one month, then depart the area. While the Marines planned the overall operation, the SEALs planned the specifics of their roles of Red Wings. Late in the night of June 27, 2005, two MH-47 Special Operations Aircraft of the Army Special Operations Command's 160th Special Operations Aviation Regiment (Airborne) (SOAR(A)) approached Sawtalo Sar. As one of the aircraft performed a number of "decoy drops" to confuse any possible enemy on the ground as to the specific purpose of helicopters, the other inserted, via fastrope, a four-man Navy SEAL reconnaissance and surveillance team in a saddle between Sawtalo Sar and Gatigal Sar, a peak just to the south of Sawtalo Sar. The insert point was roughly one and one half miles from the nearest Named Area of Interest. The team members were team leader Navy Lieutenant Michael P. Murphy of SEAL Delivery Vehicle Team 1 (SDVT-1), based out of Pearl Harbor, Hawaii; Petty Officer Second Class Danny Dietz from SEAL Delivery Vehicle Team 2 (SDVT-2), based out of Virginia Beach, Virginia; Petty Officer Second Class Matthew G. Axelson from SEAL Delivery Vehicle Team 1 (SDVT-1); and Navy Hospital Corpsman Second Class Marcus Luttrell, of SEAL Delivery Vehicle Team 1 (SDVT-1). After moving to a pre-determined, covered overwatch position, from which the SEALs could observe the Named Areas of Interest, the team was discovered by local goat herders. Determining that they were civilians, not combatants, Lieutenant Murphy released them, according to rules of engagement. The team, surmising that they would likely be compromised, retreated to a fallback position. Within an hour, the SEAL Reconnaissance and Surveillance team was attacked by Shah and his men who were armed with RPK machine guns, AK-47s, RPG-7 rocket-propelled grenades, and an 82mm mortar. The intensity of the incoming fire, combined with the type of attack, forced the SEAL team into the northeast gulch of Sawtalo Sar, on the Shuryek Valley side of Sawtalo Sar. The SEALs made a number of attempts to contact their combat operations center with a multi-band radio and then with a satellite phone. The team could not establish consistent communication, other than for a period long enough to indicate that they were under attack. Three of the four team members were killed, and the only survivor, Marcus Luttrell, was left unconscious with a number of fractures and other serious wounds. He regained consciousness and was rescued by local Pashtun, who ultimately saved his life, as in his condition, without assistance, he would surely have been killed or captured by the Taliban. With the communication that the SEAL reconnaissance and surveillance team was ambushed, the focus of the operation immediately shifted from disrupting ACM activity to finding, aiding, and extracting the SEALs of the reconnaissance and surveillance team. The operation was now known as Operation Red Wings II. After the broken transmission from the SEAL reconnaissance and surveillance team, the position and situation of the SEALs became unknown. Members of SEAL Team 10, U.S. Marines, and aviators of the 160th Special Operations Aviation Regiment were prepared to dispatch a quick reaction force, but command for launch from higher special operations headquarters was delayed for a number of hours. A quick reaction force finally launched, consisting of two MH-47 Special Operations Aircraft of the 160th, two UH-60 conventional Army aviation Black Hawk helicopters, and two AH-64 Apache attack helicopters. The two MH-47s took the lead. Upon reaching Sawtalo Sar, the two MH-47s received small arms fire. During an attempt to insert SEALs who were riding in one of the MH-47 helicopters, one of Ahmad Shah's men fired an RPG-7 rocket-propelled grenade, which struck the transmission below the rear rotor assembly, causing the aircraft to immediately plummet to the ground, killing all eight 160th Army Special Operations Aviators and crew, and all eight Navy SEALs who were passengers. Both commanders of the 160th, Ground commander LCDR Erik S. Kristensen, of SEAL Team 10, and aviation element commander Major Stephen C. Reich, were killed in the shootdown. Command and control (C2) at this point was lost, and neither visual nor radio contact could be established with the SEAL reconnaissance and surveillance team. At this point, which was late in the afternoon, storm clouds were moving in over the region. The aircraft returned to their respective bases, and a massive search began, at first from the ground, and then with aviation assets. The 16 bodies of those killed in the MH-47 shootdown were recovered. After an intensive search, the bodies of Dietz, Murphy, and Axelson were eventually recovered, and Marcus Luttrell was rescued, his survival due in part to the aid of a local Afghan villager in the village of Salar Ban, roughly 0.7 miles (1.1 km) down the northeast gulch of Sawtalo Sar from the location of the ambush. In the years following Operation Red Wings more details emerged about the circumstances surrounding Luttrell being given sanctuary by local villagers and the aftermath. Many of the details regarding the Afghans who aided Luttrell were reported incorrectly in the American press during the days after the events occurred. The SEALs' firefight with Ahmad Shah's Taliban forces began along a high-elevation ridgeline called Sawtalo Sar. (The highest peak of this ridgeline is 2,830 meters (9,282 feet)). A descent down the west side of the ridgeline leads into the Shuryek valley. The northeastern gulch in which the SEALs became trapped was in this direction, above the village of Salar Ban. To the east of the Sawtalo Sar ridgeline is the Korangal valley. As the wounded Luttrell descended the gulch, he encountered a Pashtun named Mohammad Gulab Khan from the mountain village of Salar Ban. Known simply as Gulab, he took Luttrell into his home that first day and evoked the assistance of others from his village to protect Luttrell until American forces could be contacted. This was in accordance with the cultural tradition of Pashtunwali, whereby asylum (Nanawatai) is offered to a person to protect them from their enemies. It is likely Luttrell would have been turned over to the Taliban had he descended into the Korangal instead of Shuryek. Not long before Operation Red Wings had occurred, relations with the Americans had improved in the Shuryek Valley and the greater Pech river region because of humanitarian work that had been occurring. Medical services had been extended, and a girls school was built at Nangalam. Gulab was aware of these developments and had introduced himself to the Marine commander at Nangalam, Matt Bartels, when he was visiting Matin. It was within this context that Gulab stumbled upon Luttrell and gave him sanctuary. The Taliban leader, Ahmad Shah, knew that the wounded man that he was tracking had to pass through the village of Salar Ban as he contoured downhill. Through intimidation Shah was able to ascertain which house sheltered the wounded man and demanded that he be turned over. But Shah couldn't risk a fight at that moment because he was outnumbered and other relatives and villagers would come to Gulab's aid. Luttrell was subsequently moved to different places until forces could arrive to extract him. Luttrell wrote a note and asked that it be taken to the American base at Asadabad. Because Gulab had previously met the Marine commander based at Nangalam, he asked an older man named Shina, of another part of the village of Salar Ban, to make the trek with the note to that base instead. This required a longer journey down the trails of the Shuryek valley to Matin, where he then hired a cab to drive the Pech road to Nangalam. Gulab gave Shina 1,000 Afghanis (about twenty U.S. dollars). When Shina reached the base in Nangalam in the middle of the night he met with the commander and related the story about a wounded American soldier in their village. He then gave him the note that Luttrell had written. In the weeks following Marcus Luttrell's rescue, Gulab and his family received threats from the Taliban, and they were relocated to Asadabad. Ahmad Shah and his group recovered a large amount of weapons, ammunition, and other materials, including three SOPMOD M4 Carbines fitted with M203 40mm grenade launchers, a ruggedized laptop with an intact hard drive containing maps of embassies in Kabul, night vision equipment, and a sniper spotting scope, among other items from the Navy SEAL reconnaissance and surveillance team, items which they could then use against American, Coalition, and Government of Afghanistan entities. Shah had with him two videographers during the ambush, and As-Sahab Media released a video of the ambush and the items recovered from the SEALs. A large amount of resources were devoted to the search, rescue, and recovery operations of Red Wings II. As such, Ahmad Shah and his men left the region and regrouped in Pakistan. During the following weeks of Red Wings II, ground units of 2/3 undertook a number of patrols, as did members of the Afghan National Army, Army Special Operations units, and Navy Special Operations units. These "presence operations" achieved the goal of disrupting anti-coalition militia activity, but at great cost, and upon the exfiltration of troops, Ahmad Shah and his reinforced cell were able to return to the area weeks later. A tremendous amount of global media attention was focused on the ambush and the MH-47 shootdown. The size of Shah's group increased as additional fighters joined his ranks. With the withdrawal of American and Coalition troops at the end of Red Wings II, Shah and his group were able to return to the Kunar Province and begin attacks again. The "sequel" to Operation Red Wings was Operation Whalers, which 2/3 planned and executed in August 2005. Some survivors have suffered from PTSD. Ahmad Shah's group in Kunar Province was neutralized, and Shah was seriously wounded during Operation Whalers weeks later in August 2005. In April 2008, Shah was killed during a shootout with Pakistani police in the Khyber-Pakhtunkhwa. On September 14, 2006, Dietz and Axelson were posthumously awarded the Navy Cross for "undaunted courage" and heroism. Luttrell was also awarded the Navy Cross, in a ceremony at the White House. In 2007, Murphy was posthumously awarded the Medal of Honor for his actions during the battle. On June 28, 2008, Luttrell and the family members of soldiers killed overseas were honored at a San Diego Padres game. In addition, the United States Navy Parachute Team, the Leap Frogs, brought in the American flag, the POW/MIA flag and the San Diego Padres flag. The attendees were given a standing ovation by the more than 25,000 there to watch the game. A statue entitled The Guardians stands in the Cupertino Veterans Memorial Park, in Cupertino, California. Sculpted by noted artist W. Stanley Proctor, the statue depicts Matthew Axelson and James Suh, natives of the region, standing back-to-back. W. Stanley Proctor sculpted a work for the Veteran's Memorial Park in Cupertino, California, called The Guardians, which commemorates the SEALS killed in the operation. It is one of the first sculptured memorials to those who served in the War in Afghanistan. It is a large sculpture of two Navy SEALs killed in the line of duty in Afghanistan in 2005 (the event which inspired the war movie Lone Survivor (2013)) and was dedicated by Secretary of the Navy Donald Winter in November 2007. The sculpture depicts Matthew Axelson and James Suh in full combat equipment. Proctor offered his opinion to the Tallahassee Democrat that it is "my best work yet". Because of his scrupulous devotion to realistic depictions of humans, Proctor was the personal choice of Axelson's family for the project, and they made that recommendation to the committee. In the June 12, 2007, article "Survivor's book dishonors son's memory" by Michael Rothfeld in Newsday, Michael P. Murphy's father Dan claims that Lieutenant Murphy would never have considered executing unarmed civilians, let alone putting such a grave decision up for a vote (in reference to the purported vote of execution of unarmed locals). Military protocol, United States and international military doctrine, and rules of engagement strictly forbid harming unarmed non-combatant civilians, with one of the specific rules of engagement in effect at the time stating, "Civilians are not targets!" The American film Lone Survivor (2013), starring Mark Wahlberg, is based on Operation Red Wings. The 2013 film is an adaptation of the autobiography of the title character, Marcus Luttrell, titled Lone Survivor: The Eyewitness Account of Operation Red wings and the Lost Heroes of SEAL Team 10 (2007). ^ Operation Redwing was a 1956 series of nuclear weapons tests. ^ a b "Helicopter crash victims identified". CNN News. July 4, 2005. Retrieved 2008-12-14. ^ Zimmerman, Dwight (December 29, 2011). "Lt. Michael P. Murphy, SEAL Delivery Vehicle Team ONE". defensemedianetwork.com. Retrieved 2012-01-22. 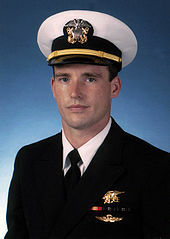 ^ "Lt. Michael P. Murphy USN". United States Navy. October 2007. Archived from the original on 2012-09-15. Retrieved 2012-01-22. ^ a b Naylor, Sean D. (June 18, 2007). "Surviving SEAL tells story of deadly mission". Army Times. Retrieved 2008-07-21. ^ Aerial Map of Sawtalo Sar region, Darack.com. ^ Topographic Map of Sawtalo Sar region – Darack.com. ^ a b Darack – p. 126. ^ Darack – p. 130. ^ Satellite image via Google Maps of location of Nangalam in Afghanistan. – GoogleMaps.com. ^ Darack – p. 133. ^ a b "U.S. military searches for missing SEAL". CNN News. July 7, 2005. Retrieved 2008-12-14. ^ Jeanette Steele (2 February 2013). "Heaing a Broken Life". San Diego Union Tribune. Archived from the original on 2013-12-14. Retrieved 4 February 2013. ^ Dupee, Matt (April 17, 2008). "Bara bin Malek Front commander killed in Pakistani shootout". Long War Journal (LongWarJournal.org). Retrieved 2008-12-10. ^ "Operation: Never Forget". Families of American Military, Inc. (FamOnline.org). June 30, 2008. Archived from the original on December 16, 2008. Retrieved 2008-12-14. ^ Wilson, Matt (November 19, 2008). "Cupertino ceremony honors uniformed men and women". Cupertino Courier. San Jose Mercury News (MercuryNews.com). ^ a b "About the artist: W. Stanley "Sandy" Proctor". W. Stanley Proctor bronzes. Retrieved August 13, 2014. ^ "Bronze Gators". What’s News. Washington and Lee University. June 18, 2010. Retrieved September 6, 2014. ^ Li, Anna; Reis, Julia (November 12, 2012). "Silicon Valley honors veterans". Peninsula Press. Retrieved August 20, 2014. ^ Johnson, Emily (January 16, 2014). "The Movie, Lone Survivor, Has a Local Tie to Tallahassee" (Video). WCTV. Retrieved September 4, 2014. ^ "SEALs in bronze: Tallahassee artist memorializes 'Lone Survivor' warriors". Tallahassee.com. February 24, 2014. Archived from the original on September 6, 2014. Retrieved September 5, 2014. ^ "Afghanistan-Iraq War Memorial - Memorial Park - Cupertino, CA - Afghanistan-Iraq War Memorials". Waymarking.com. October 29, 2011. Retrieved September 6, 2014. ^ a b c Hinson, Mark (February 22, 2014). "SEALs in bronze". Tallahassee Democrat. Retrieved August 13, 2014. ^ "Matt Axelson Family Interview". Military Movies & News. May 12, 2010. Retrieved September 6, 2014. Luttrell, Marcus; Robinson, Patrick (2007). Lone Survivor: The Eyewitness Account of Operation Redwing and the Lost Heroes of SEAL Team 10. Back Bay Books. ISBN 0-316-06759-8. Williams, Gary (2010). 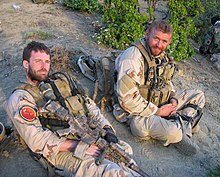 Seal of Honor: Operation Redwing and the Life of LT. Michael P. Murphy, USN. Naval Institute Press. ISBN 1-59114-957-6.